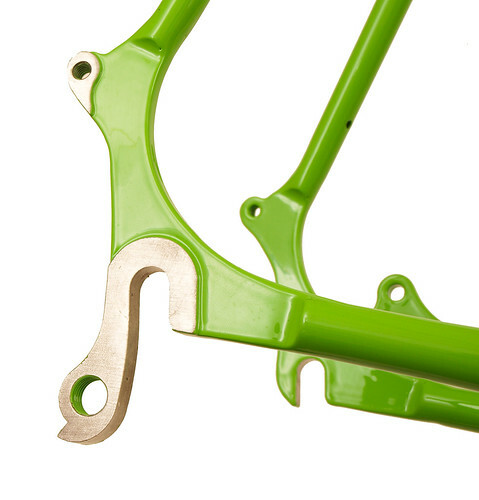 For half a century, lug brazed bicycle frames set the standard for workmanship and performance. No one matches Waterford’s mastery of low temperature silver brazing, and no one matches the results achieved in performance, workmanship and durability. Each frame includes made to measure geometry, with tubing individually selected to give you the desired feel and handling. 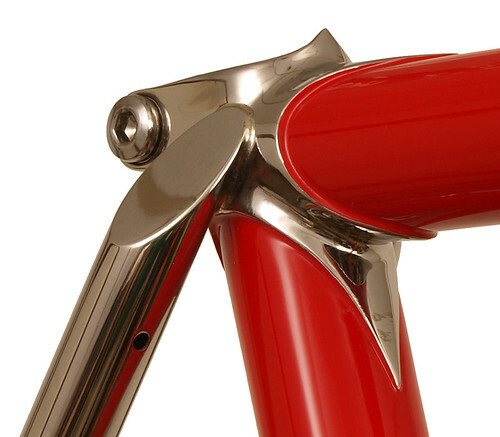 Our stock “Italian-cut” lugs offer a clean look that will stand the test of time. Optional Newvex lugs gives you a classic look from half a century ago with today’s design and materials. Our custom lug program eliminates limits on lug angles with several signature styles available. 22-Series with Stainless Lugs and Stays - in Intense Red. This Road Sport design is perfect for the performance rider looking for a long distance steed. There's nothing like the look of stainless steel. 22-Series with Stainless Lugs and Stays - in Intense Red. This Road Sport design is perfect for the performance rider looking for a long distance steed. There's nothing like the look of stainless steel. Shown here is our clean internal cable routing. 22-Series with Stainless Lugs and Stays - in Intense Red - Stainless Seat Cluster View. 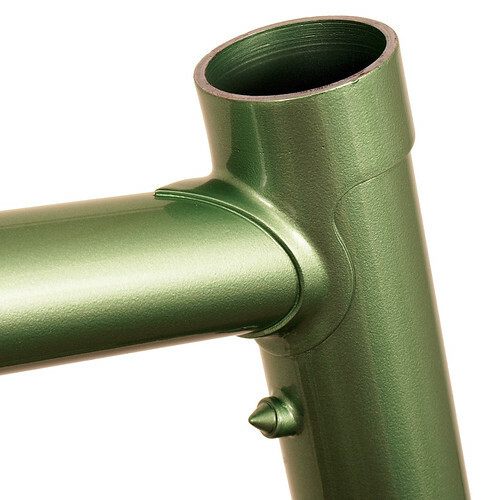 Downtube detail on Waterford 22-Series Disc Touring in Big Bad Green with Black Masked Lugs and tube lines. 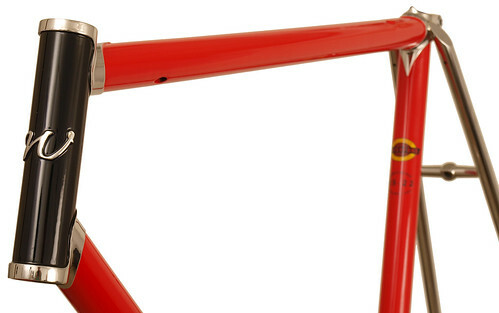 This 66cm frame is design to support fully loaded touring with an unmistakable style. 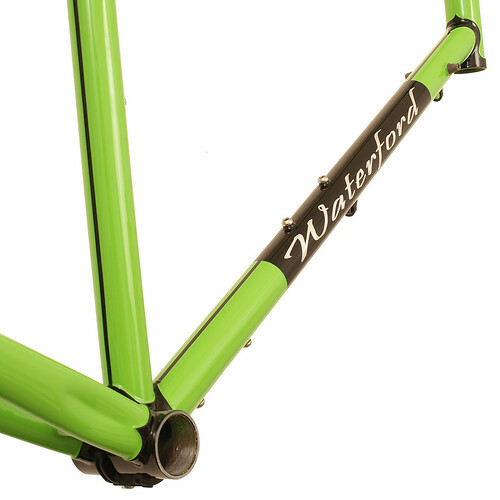 Waterford 22-Series Disc Touring in Big Bad Green with Black Masked Lugs. 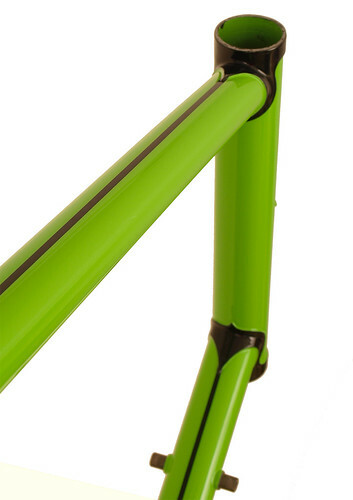 This 66cm frame is design to support fully loaded touring with an unmistakable style. 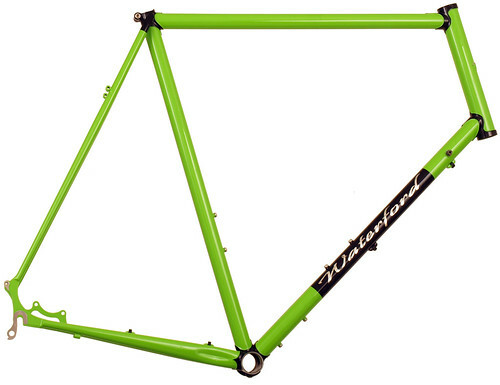 Front view of Waterford 22-Series Disc Touring in Big Bad Green with Black Masked Lugs. 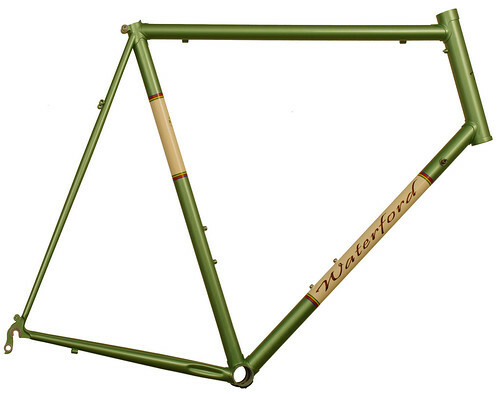 This 66cm frame is design to support fully loaded touring with an unmistakable style. 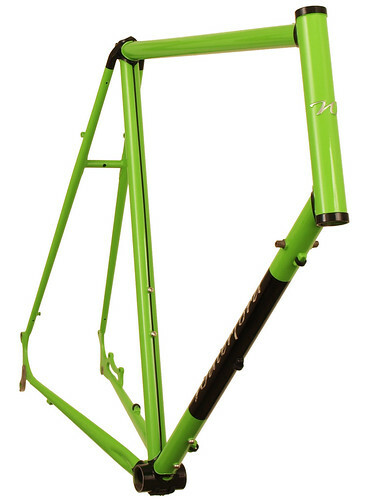 Top tube view of Waterford 22-Series Disc Touring in Big Bad Green with Black Masked Lugs and frame lines. 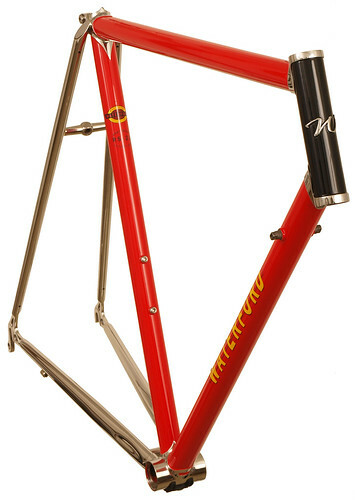 This 66cm frame is design to support fully loaded touring with an unmistakable style. Seat cluster detail Waterford 22-Series Disc Touring in Big Bad Green with Black Masked Lugs and frame lines. 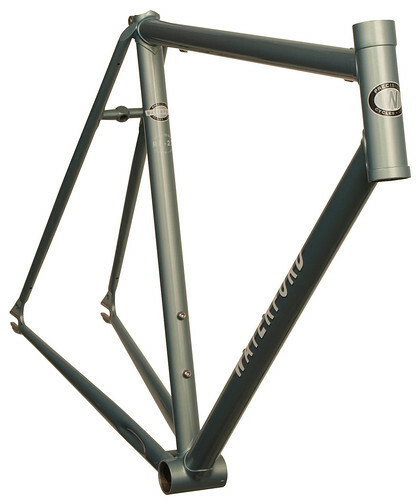 This 66cm frame is design to support fully loaded touring with an unmistakable style. 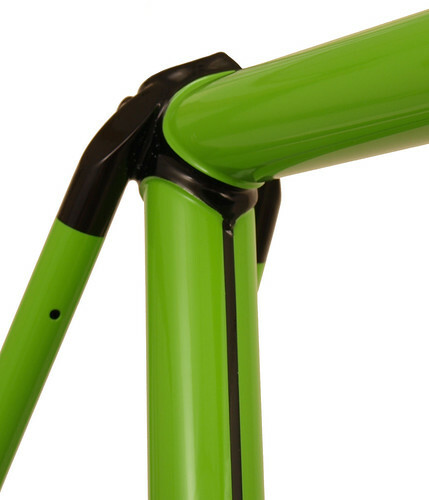 Waterford 22-Series Disc Touring in Big Bad Green with Black Masked Lugs - Rear Dropout Closeup. 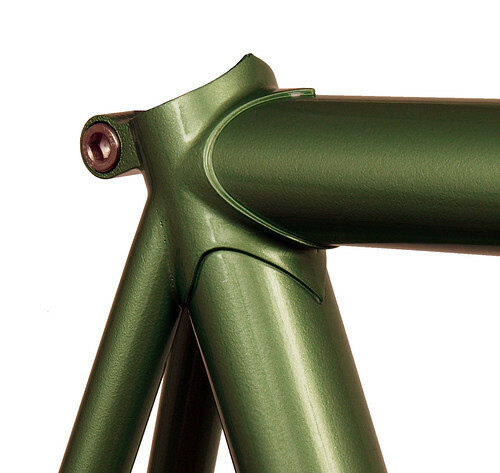 Rear dropout detail of Waterford 22-Series Disc Touring in Big Bad Green with Black Masked Lugs. Laser machined from stainless steel, this dropout design has lots of clearance for brake calipers and offers excellent corrosion protection. 22-Series Waterford with Italian Cut lugs in Chameleon with Vanilla Shake Panels - Upper Head Lug Detail. 22-Series Waterford with Italian Cut lugs in Chameleon - seat cluster detail. 22-Series Waterford in Chameleon with Vanilla Shake Panels. Clean lugwork and classic styling. 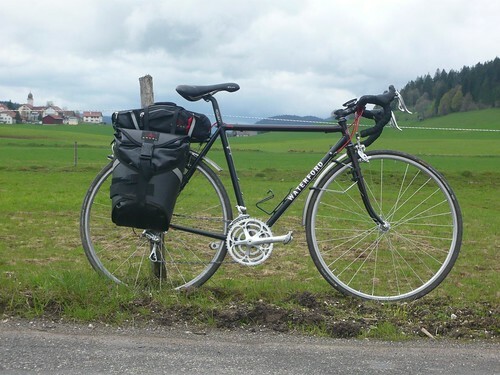 AF shows off both Switzerland's beauty and his Waterford RS-22. 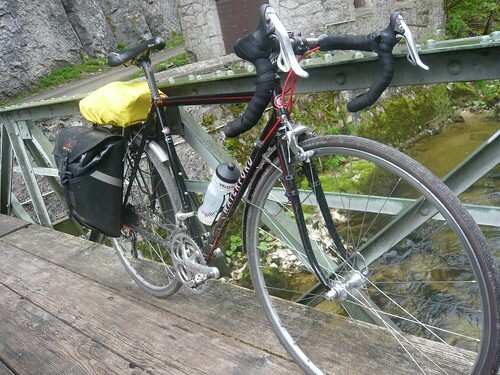 This 54cm Black beauty with red pinstriping is shown here after a ride through the Swiss Alps. 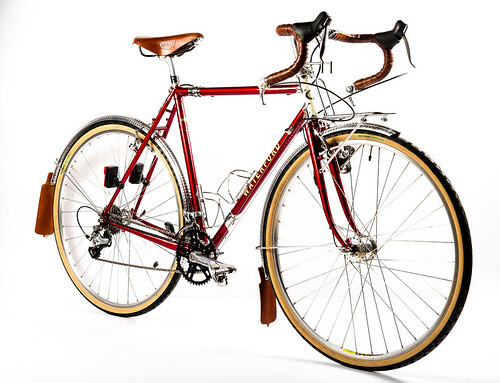 Waterford 22-Series Artisan Rando Bike - complete includes stainless lugs and BB, S&S Couplers, 57mm reach brake compatibility. Styled in Wineberry over Pure Gold with Vanilla Shake Head Tube. Photo supplied by Bike Doctor Frederick, Frederick Maryland. 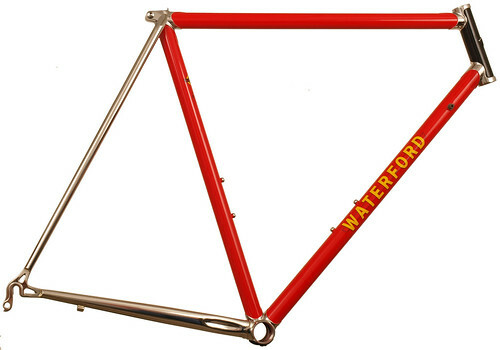 Front view of Waterford 22-Series Artisan Road Fixed Gear in Sea Silver Poly. 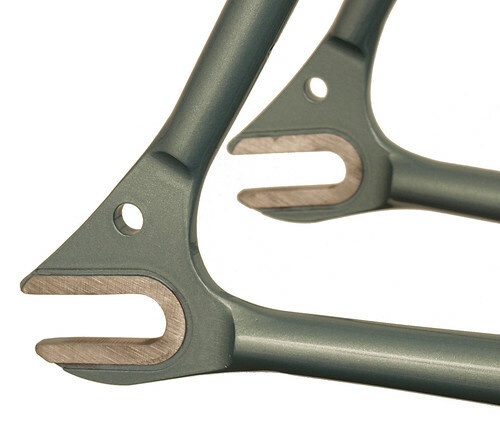 It sports stainless steel track dropouts with bordered faces and a head tube extension. Rear dropout detail on a Waterford 22-Series Artisan Road Fixed Gear in Sea Silver Poly. 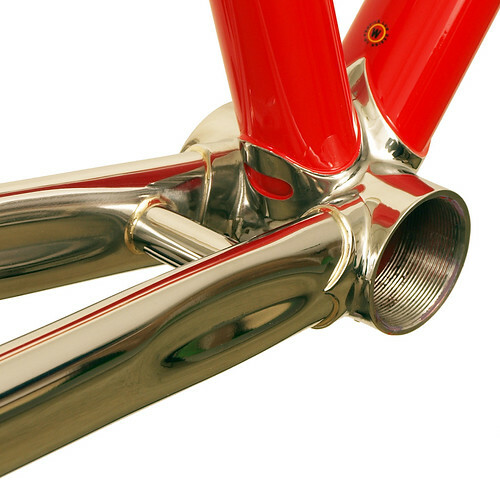 It sports stainless steel track dropouts with bordered faces and a head tube extension.